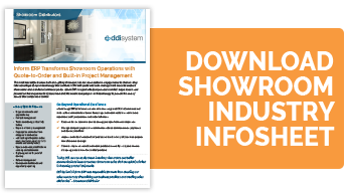 Keeping showroom distributors among the most technologically capable and successful in their industry is at the core of DDI’s continuous innovation. Inform ERP Software takes Forté Group distributors to the next level with native CRM, quote and order management, and barcode-enabled showrooms to connect you to your customers during every interaction. Inform’s end-to-end ERP technology provides real-time access to data that harmonizes operations into a seamless workflow for optimal performance. Managing showroom sales requires handling multiple shipments of an order and payment cards with precision. Inform easily accommodates your customers’ requests to deliver only rough-in products or specific rooms, while carefully tracking previous shipments, payments, and maintaining deposit thresholds. Users quickly manage partial deliveries and ‘take now’ items with visibility into inventory, warehouse staging location, and cash application. Cater to the showroom customer from the floor. Using Inform’s QuickOrder app and barcode labeled display products, showroom specialists can effortlessly quote and create orders for a true value-add service to clients. QuickOrder allows users to engage with a touch-enabled device to expedite the checkout process and create a seamless customer experience. 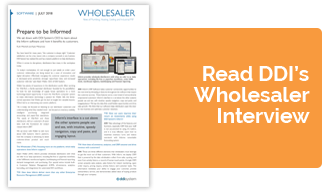 Take advantage of detailed insight into inventory levels and minimum quantity requirements, to easily service customer needs. Inform’s embedded Customer Relationship Management system strengthens customer interactions with engagement touch points intricately woven throughout your ERP. The result is a superior customer experience, increased spending decreased price sensitivity, and resistance to competitive overtures. Plus, Inform caters to showroom requirements such as deposit management, special order status, cash sale handling, delivery date and warehouse staging. Go beyond descriptions, costs, and packaging details. Inform stores four types of product descriptions, images, specification sheets, MSD sheets, videos and online links, as well as the menu structure for your Inform eCommerce site. Easily make changes to your product content for maximum control over the product information your customers see. Map more than 50 fields to optimize the information displayed to customers, and remain a distributor of choice. Overall, my entire team is very enthusiastic. DDI’s Inform solution is modern, powerful, and allows our team to better service our customers. The greatest ROI so far has been the maximization of workflow efficiency. We have gained a $60K per year employee with the ability to redirect people towards business driving activities. As a new sales associate, it has helped me efficiently create sales invoices and purchase orders using our customer data base and pricing matrix. Michael M. J.W. Wood Co., Inc.